It’d been a while since I’d driven up 23rd Street in Richmond. Like East Oakland, it’s a string of taco trucks, Laundromats, remittance centers, carnicerias, and auto body shops, scrappy entrepreneurs of businesses that can seem held together by little more than Bondo and the daily needs of people in the neighborhood. Crusty old Andy’s Donut Stop, you still serving raised old fashioneds at 3 a.m. for guys about to hit the early shift or headed home from the swing shift? Still ladling out footy-smelling bowls of caldo de res, Pepito’s Deli? The guy cooking chickens over mesquite, sill setting up in an empty lot, grill anchored to the uneven ground with cinder blocks? 1. Super Churro cart: Appears (sometimes) in the strip-mall parking strip in front of the Rancho Market and Coin Laundry, corner of 23rd St. and Wendell Ave. Pay a buck to the serious-looking Oaxacan guy behind the Plexi flap here, and he’ll give you a bag of freshly fried churros glistening with cinnamon sugar. They’re good, fried darker than usual. Way to get him to smile: Ask about his favorite football team, C.F. Pachuca. 2. Raspados at Taqueria Cha-Ro-Las taco truck: Carwash lot, corner of 23rd St. and McBryde Ave. Haven’t tried the tacos, but — lured by a pair of hand-written signs advertising raspados with fresh fruit toppings — I stopped. You can get pineapple, coconut, strawberry, or the one I tried, tamarind ($2). 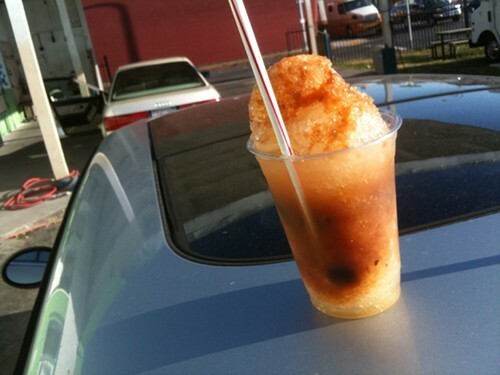 The lady in the truck fills a cup with crushed ice, ladles over homemade tamarindo syrup, tops it off with a snowball-sized scoop of more ice and another thread of syrup. Delicious, with the bonus of fuzzy-pulped tamarind seeds that sink to the bottom. Sit in one of the busted wooden cap’n’s chairs out front or use the hood of your car as an impromptu table. Tamarind raspado from Taqueria Cha-Ro-Las. 3. Curbside fresh garbanzos: From a van parked on 23rd St. near Garvin Ave. The vendor wears a Clint Eastwood-style flat-top black leather cowboy hat, fronts a couple of gold teeth caps, and has a Seventies-era tricked-out van. “Se vende garbanzas frescas,” a handwritten sign proclaims — dude says they’re from Fresno, $13 for a huge bundle the size of a ripped-out tomato plant. “Go 'head, pick out the one you want,” he says. Will he be back again tomorrow? Maybe Saturday, he says, maybe not — he’s been having trouble with his van. Bonus buy: a couple of frilly dolls in slightly dog-eared pink boxes, displayed on racks in the van’s back doors.